So it’s about 5 weeks post launch of my niche site experiment and as many of you have stated in previous updates, I’m going to need some backlinks to rank for any competitive keywords. I stayed on Page 3 of Google for my target keyword for about 2 weeks, then completely disappeared and re-appeared on page 7 last week. This fluctuation is to be expected with a new site that has no quality backlinks. Plus, I realize this is not 2011, so sitting and waiting for Google to push me up the rankings by only writing content is unrealistic today. So I wanted to dedicate this entire post to backlinks and go over what I will and won’t do. 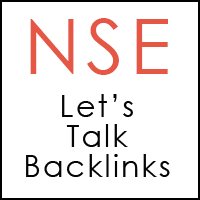 To all the newbies, a backlink is simply a website that links to yours. Google relies on these to help rank websites and they like to see a more natural build up of backlinks over time. The more relevant and quality those links are, the more they will help you. One advantage of having websites in different niches, is it teaches you that you cannot apply a one-size-fits-all analysis for a website’s rank. You may remember my 2011 experimental site that ranked organically without me manually acquiring backlinks. A lot of you thought I was saying I earned those rankings without backlinks. It’s just that they were earned slowly and naturally over time. And what’s interesting is that Google is still not showing any backlinks in Google Webmaster Tools. So I guess the backlinks are not significant enough for Google to list them. That site also taught me that you don’t really need a lot of backlinks if you are in a niche that is not overly competitive. That’s why so many people emphasize the importance of doing keyword research in the beginning. Having said that, I didn’t really do much research for the previous experiment site at all. I got lucky in that I happened to choose a niche that didn’t have much tough competition, yet there were enough searches for less competitive (long tail) keywords that I was able to rank for. Plus, that was two years ago and times have changed. I’m not sure if I would have those same results if starting today. OK, so let’s get back to my new experiment. I’ve made it no secret that I hate keyword research. Well, if there’s one thing I hate even worse than that is backlink building. Not only are many of the strategies monotonous (yawn) and not guaranteed to work anymore — but if you overdo it, you can ruin your site’s reputation with Google forever. Option 2) Build them manually through article marketing, guest posts, link wheels, link exchanges, forums, blog commenting, buying expired domains and linking them to your site, etc. Option 3) Earn them naturally and slowly over time by building relationships via social media, etc. Option 1 will definitely get you ranked faster, but if you get too aggressive you can get penalized by Google. I already know what some of you are thinking. Yes, some of the “black hat” strategies like buying links still work. ViperChill proved it in this post and shows people are still finding ways to game the algorithm and getting tons of traffic. And I do understand his frustration. If nothing else, it proves why traffic diversification is key. Option 2 is considered to be more safe, but even some of these tactics can get you into trouble. For example, having too many guest posts or blog comments with the same anchor text (the text inside the link) can send up red flags. Plus, Matt Cutts even admitted the Google algorithm has been adjusted, and you no longer get as much of a backlink benefit as you would before. Option 3 is obviously the ideal way to build links because it’s more natural, but it’s also the hardest and takes the longest — which is why so many people end up resorting to options 1 or 2. The other thing you need to watch out for is link velocity — meaning if you gain links too fast, that looks unnatural so you could be penalized for that. The tricky part is no one really knows what the correct velocity is for gaining links, and there are even link building services (sorry, no recommendations here) that will drip feed your links over time to make your link building look natural. By the way, Google recently added a “Manual Penalty” section to Google Webmaster Tools so you will know if you you’ve been penalized or not. Well, I don’t plan on buying any links or participating in linking schemes. So option 1 is out. Yes, I know this can still work, but I want to spend more time on option 3 and earn links through relationships or trying creative strategies I’ve never done before. 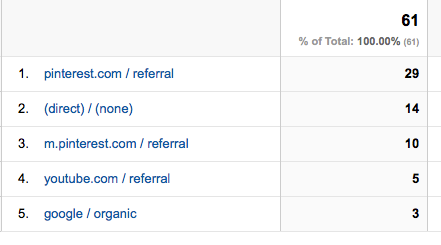 In the past, I would typically get organic traffic first and then start expanding into other areas (social media, etc.) later. However, different times call for different measures. I will probably do some strategies in option 2 (commenting, a guest post or two) but not too much. I really want to think outside of the box this time. And even if this takes a lot more time, I’m OK with that. Last week I began networking with people on Twitter and started experimenting with Pinterest. Yes, Pinterest links are nofollow (meaning they have little impact on rankings), however you can still use it for traffic and exposure. Some even believe that nofollow links can still have a minimal impact. I really love Pinterest because you can come up with creative ways to use images to share content. 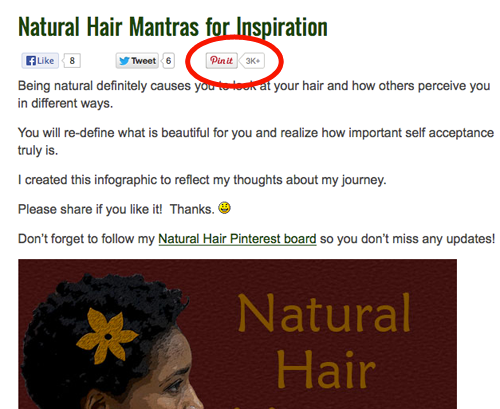 An infographic I created and posted on my hair site last month received 3,000+ Pins so far and sends traffic daily. This is the ideal social media site for a niche that’s very visual. Last month Pinterest sent my hair site 835 visitors and that’s mostly from 3 infographics that were created over the span of 6 months. So imagine if I replicate that tactic more often. Now, I do believe that Pinterest works better for some niches over others. Also, the QUALITY of traffic is more important than quantity. So I will hold off on going into much detail with what I’ve done with the new site. I want to keep testing to see if this strategy is even worth my time for the experimental site. That’s the other reason I’m doing things in phases so I can see what works and what doesn’t. Even though I’m still building content for the new site, I’m now starting to focus more on marketing and engaging PEOPLE instead of just bots. If you’re not going to buy links or participate in many of the older link building methods, you have to get creative and try new things. Yes, it’s hard work and takes longer, but the long-term rewards are much more stable. I just want to clarify that I am by no means suggesting you build a business around Google traffic. I’m just doing this experiment for the challenge to see what it takes to rank a brand new site today. So it may be a while before my next update, but I definitely wanted to dedicate a post to backlinks since that is such a hot topic with regards to ranking a website. Trying to rank a site without building links is a long haul in these times. Producing great content can only get you so far in my opinion as there are just so many wordpress blogs and sites coming online and there are only so many spots in Google. I really need to know how to build websites that Google will like and not punish in the end!!! Thank you Lisa your always a great help.